Melinda is a delightful silk chiffon veil! This romantic veil suits slim-fitting wedding gowns, and chiffon or georgette gowns. This single tier veil made of 100% Silk Chiffon has a stitched edge, which is softly ruffled. It can be worn high or towards the back of the head, as shown. Starting from waltz length (165cm) and available in longer lengths. Cannot be worn over the face. Made from 100% Silk Chiffon. Also available in 100% Silk Georgette. Available in White and Ivory. 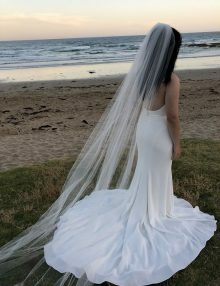 Waltz length veil is pictured. 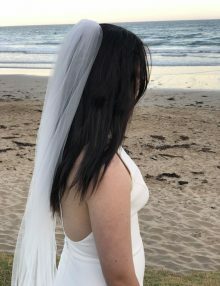 This veil is worn by Leanne P.
For a shorter version of this veil, see Melody ST veil. Please note: This veil is made to order. Production time frame is 2-3 weeks. Delivery within around 7 business days (within Australia). Rush fees apply.